If Simmons doesn't develop his shooting, both10 feet out and foul shots, the Sixers are going nowhere. The All-Star denies being tired, saying his struggles are about his new role following the trade for Jimmy Butler. Sixers center @JoelEmbiid stressed that he’s NOT upset with the acquisition of @JimmyButler. He’s just upset with how he’s playing and wants to play better for his team. Pompey is routinely unreliable--he was the source of the first story, too. Embiid said what he said after the game and now he's saying what he said this morning. That's okay, he was being blunt and emotional. But Pompey didn't get anything wrong. What's your issue with Brett Brown? The players LOVE him and play hard for him and most importantly they play defense for him. They lost to a better Celtics team in the playoffs last year. He now finally has a decent team and two young stars that still are growing their games. I totally agree with you on Simmons. If he doesn't get a better shot, we need a point guard that can shoot and Simmons has to move to the 4. I don't think he's very smart. I have seen them blow countless 20+ point leads, to the point of it being excessive (it's a game of runs so it happens, but not to the extent of the past few seasons). Sure, you could argue last year they were a young team, but it's also a result of his pass happy, fast tempo offense which he never slows down with a big lead, giving the opposing more possessions than they otherwise might have. Plus, they just chuck 3s, when you’d think they’d slow the tempo and focus on some higher percentage shots in the paint. Absolutely no discipline -- up 7 with 2 minutes left? Go ahead and chuck a three with 20 left on the shot clock! And no accountability for players who take dumb shots (which is why I think the players love him). I loved Cov's defense, but he was a big culprit of this last year, especially in the heartbreaker Houston game last season where they hit a buzzer beater -- I think it was a 6 or 8 point lead with 2:30 or so that we gave up because they just started chucking threes. The Celtics and 76ers were close last year, IMO, at least I don't think they were 4-2 worse. Blowing the 22-point lead was inexcusable in game two, and Brown didn't even try to shut down the Celtics' run via timeout in the second quarter as they closed in on halftime, so the lead was totally gone before halftime. I just found it ridiculous and figured that momentum swing was probably too much to overcome for the remainder of the series. Celtics are a great team, so is it guaranteed they'd have held them off with a timeout? Of course not, but I would've liked to see some semblance of common sense to give them a fighting chance. It was the same story, just a different book, and Brown didn’t show that he learned anything, IMO. Embiid on the perimeter so much is also idiotic and I've always felt that way, and I never truly knew if this was by Brown's design or Embiid (which, if it was Embiid, again shows a lack of accountability). 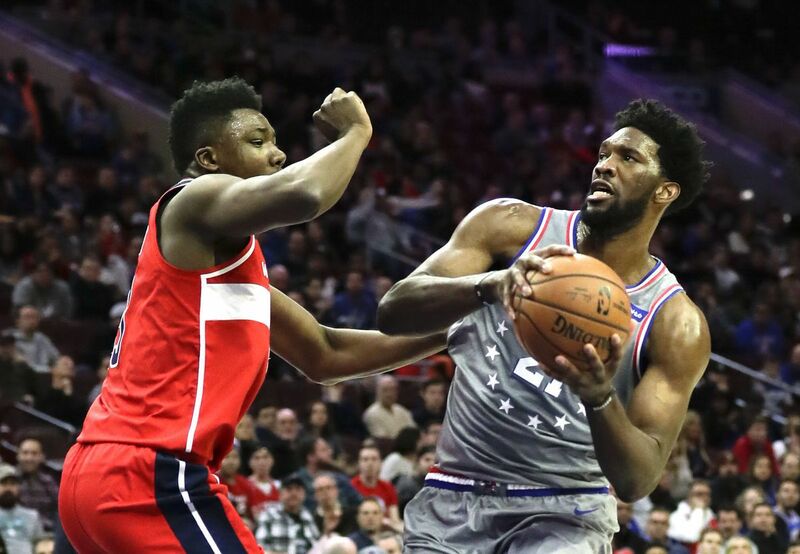 But based on Embiid's comments this week, it seems to be Brown's insistence, which makes little sense to me because of how effective Embiid has been in the paint (had a few bad games here lately, but I don't really see why you want to take your best post presence out of play). I liked Richaun Holmes as a backup big over Amir, but he rarely played him. Richaun is looking pretty solid for PHX, albeit on a bad team, so the jury is still out. But if he ends up being a regular contributor as he has been for the rest of the season, to me, that’s another strike in terms of player evaluation. I think you can give him credit for Covington, who became a very good defender and a valuable trade chip in acquiring Butler. I feel like Embiid would have developed as he has based on his immense talent, but you can credit him with it since it technically happened on his watch. But the development of Noel, Okafor, Fultz, and Simmons’ jump shot under his watch are all strikes. If I’m management and see first round picks fizzle in this frequency, I’d start to wonder if this is the right guy. I think most professional coaches could have achieved what he achieved last season and this season thus far based on the talent we have. The talent, even despite Simmons’ deficiencies, can probably coast to a 3-4 seed minimum based on the talent they have in Embiid, Simmons, and Butler. Problem is for Brown, when you’re in the playoffs and face other talented teams and other higher-end coaches, I don’t see him as a coach that can consistently beat a Boston or a Toronto in a series. I really like the Butler trade not only due to his talent, but it might be the key to Brown being removed if they underachieve in the playoffs. Prior to Butler, I figure Brown gets a minimum three more years (ownership seems to love the guy), but I could see a move coming sooner if they continue to fall short via the same basic mistakes. Time will tell, I suppose. Until then, I’ll keep watching and rooting and hoping this core doesn’t go to waste. Reports are that the Lakers are trying to trade for Ariza, who is a perfect fit for the Sixers, hopefully Brand gets his foot in the door and beats them to the punch. Sixers with a nice easy win against a shorthanded Pistons team. Butler left the game early with a groin injury, no update yet as to how serious it is. Korkmaz had a career high 18 points Shake Milton even got his first NBA minutes and had a nice dish to a Amir Johnson for a dunk. Is anyone in the media ever going to ask Brown if/how they are working with Simmons to develop the ability to shoot jump and foul shots? Isn't developing our young talent's skills one of Brown and the coaching staff's main jobs? Simmons can drive to the basket all day long against poor defenses, but if he goes 2-9 from the foul line like last night or vanishes when shut down against better teams like Toronto, the full value gets blunted. They've asked that question often...it's been answered often. Ben Simmons spent the off-season working on his shot and it's documented he continues to work on it. Or are you just looking for things to blame brett brown for? I admit it's hard to watch a 20-year-old NBA-quality athlete shoot like Simmons does. I now coach middle school teams (gave up my varsity job b/c of the time requirement, and kids middle school age improve exponentially practice by practice, but I digress...), and 80-90% of my MS kids have better foul shooting form than he does. It makes you think he's not trying, and the team isn't trying, but some athletes just don't take to certain kinds of coaching very well, even if they are earnestly trying to improve. I think it goes something like this in the athlete's head. "Although I pretty much trust this guy, I'm afraid to change things because it's worked for me this way and I just might get worse." It's irrational fear, but fear nonetheless. I have a friend who is a mid-80s golfer, but he slices off the tee with a driver (or any wood or hybrid) so badly that he has resorted to playing only 2-irons from the tee. He knows he has an outside-in swing path, but he is terrified to correct it because it works for controlling his iron shots. He has taken dozens of lessons, but he just can't get better because he won't commit to actual, meaningful change. It's a shame because he is a magical short-game player and putter. Great guy to have in a scramble. Back on topic, sometimes you have to get worse to get better, and pros think they can't afford to get worse. Basically, LAL lands Ariza, Sixers get Caldwell-Pope, and not sure who the Sixers would give up. A three-team swap between the Sixers, Lakers and Suns would be a little tricky. Ariza is making $15 million this season while Caldwell-Pope is making $12 million. Since both players were signed this offseason, neither player can be moved until Dec. 15. What would the Sixers have to give up? Well they’d basically have to dump salary to the Suns in order to make the deal work. They do have a $2,526,840 trade exception from the Jimmy Butler deal — since they gave up more salary than they took on — so that should certainly help. But as far as actual assets, it’s hard to say. Is this like when people were saying how Jalil was really working to get into condition over the summer so he could make a run at playing the 4 his second year. And his 3rd year. Thing I always wondered is with his Dad having had a long, hard scrabble career, how could he watch as his son developed without any apparent regard for developing a shot? I'd say the same for Lonzo -- what a disgusting stroke -- but in that case its easier to understand. Ooh, no thanks. Caldwell-Pope shoots 34.5% from three, Sixers should be able to find a better SG than that. Have you seen improvement in Simmon's shooting? I have not. Do we know what he is doing to work on it? Do we know what he did during the off-season? I've rarely seen him take let alone make a jump shot outside of 10 ft in any game and he is 58% at the foul line. That is awful. 76ers lose to Nets, give up 127 pts. Embiid with a very good showing with 33 and 17, but the defense and turnovers again tell the tale unfortunately. I thought the culture was to be defensive here now. They can’t stop anybody.